« Design—the skillful use of materials to frame new ideas and innovative forms—may be a fundamental aspect of every culture, but it has become a field of contention in present-day China. In the west, most concede that China is a leader in world manufacturing, and praise its ability to produce and reproduce, but this is a “back-handed” compliment. Because amidst this praise is the more subtle criticism that China can only mindlessly reproduce without the ability to come up with its own original designs. As if “manufacturing” and “designing” are two inherently opposing forces, they grant China high marks in one arena while disqualifying the entire country from the other. Conscious of this criticism, a new generation of contemporary artists have set out to challenge this presumption, not only by creating works of art brimming with originality but also with highly conceptual works of art that turn the very accusation on its head. The pioneer of this trend is Shao Fan, an artist who since the mid-1990s has been making works that defy the categories of “design” and “art” by combining both agendas seamlessly. Born in Beijing in 1963 to a family of renowned artists, Shao Fan recalls a time when art was not merely a free-form means of expression, but was supposed to fulfill social and political purposes, for better or for worse. Alternatively, he has lived through the transformation of China over the past two decades, watching treasured objects, particularly classical Ming furniture, be churned out as bad replicas for a growing consumer market. As one China replaced the other, Shao Fan sought out a means of demonstrating this transformation and the way it has redefined such basic terms as “art”, “function”, “purpose” and “design”. The result is his series of works that are impossible to label as mere sculptures, combining elements of Ming furniture with new materials in ever more imaginative ways. Some call his work “deconstruction”. Others prefer “reconstruction.” But it is probably better to forget both ideas, since he does not view his final products as either a critique or an improvement over the original Ming furnishings that inspire his craft. Trained as a painter at the Beijing Arts and Crafts College, he began to explore three-dimensional work after graduating in 1984. 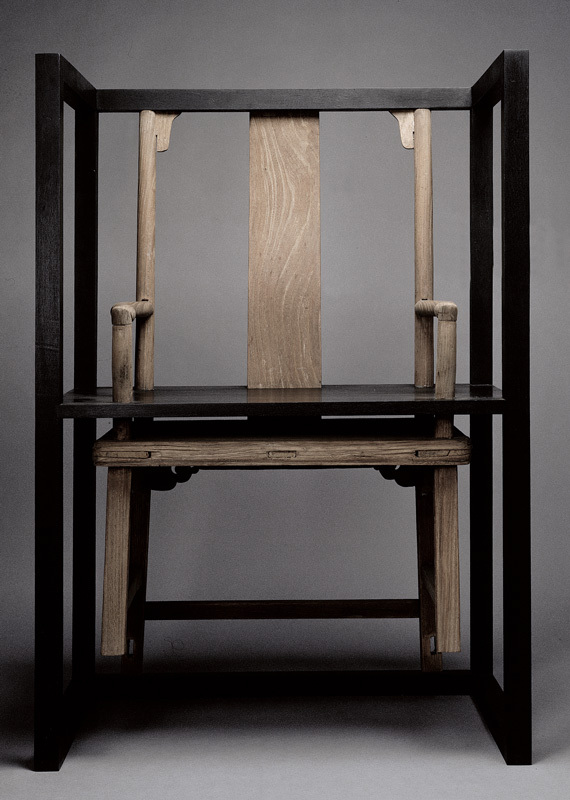 Ten years later, in a Beijing of unparalleled artistic freedom but filled with a burgeoning counterfeit antiquity trade, Shao Fan made his first works using parts of Ming chairs, to both underscore the destructiveness of commodifying these rare cultural artifacts and to celebrate the craftsmanship of the originals. He investigated the joinery of Ming furniture, the sophisticated way that this furniture was put together without nails or glue. In the 16th century, when these objects were first created, this practice of invisible carpentry was in fact inspired by the ideas of scholars and intellectuals of the period, looking for ways to incorporate the simplicity and grace of Buddhist beliefs into everyday life. Likewise, this artist reinvigorates the notion of gracefulness—an aesthetic that has been trampled upon in China’s rush towards modernization—by combining the fluid wooden forms of Ming furniture with the harsh, sharp edges of new materials, especially Plexiglas. Sometimes Shao Fan’s projects underscore a meeting of past and present. One of his first works, titled appropriately Work No. 1, 1996, encased a straight-edged geometric sculpture shaped like a chair between two halves of a classic Ming chair. Another piece from that period, Work No. 3, merely added one Ming arm to a similarly abstract rectangular chair. Such simple works have evolved into a much more subtle consideration of functionality as in Mirror Image, 2006, in which four Ming chairs are combined to form a clover-leaf, all facing away from each other and joined from behind. At first glance, it looks like a truly dysfunctional object, but the artist is quick to point out that it could serve quite nicely in the center of an art gallery, allowing four visitors to sit down facing different directions. Functional or Unusable? Ideal or Impractical? This is the question raised again and again in Shao Fan’s inquiries. Often he combined elements of chairs with abstract geometric shapes—as if a length of Plexiglas could be folded, like paper, to also form a chair. Many of these works look like iconic forms, or letters of an unfamiliar alphabet, far more creative than an average piece of furniture. But, as far away from pure design as this artist seems to wander, all of his projects return to the original understanding of Ming furniture itself. Even with Plexiglas, he seamlessly assembles his pieces, which appear to come together by magic, as convincing as the hidden joinery in the original furniture. Always, his objects, even when functional, make viewers think about why they assumed they could sit down on this piece that looks nothing like a chair and why they hesitated before another, equally impossible, chair. The use of mirrors, which Shao Fan regularly incorporates into later works, adds another layer to this issue of invisibility. At times, it makes the chair look as if it is floating in space; other times, it looks like the piece of furniture has exploded. But in every case, viewers can see themselves examining the object, thereby considering their own consideration of the work of art, never able to escape seeing themselves caught in the act of looking. Though Shao Fan’s connections to his own cultural history may be easy to discern, there are far more intriguing aesthetic possibilities to think about, if his work is linked to those of minimalist artists well-known in the United States and Europe. Like Donald Judd, an American minimalist from the 1970s who reduced the art object to bare plywood cubes, Shao Fan makes us stare at the materials that he uses and reconsider them as works of art when removed from their usual, more practical, contexts. But, Shao Fan’s project bares strongest similarities to the work of Richard Artschwager, another American artist who combined a Pop sensibility with minimalism, to force viewers to reconsider art and design. Artschwager did not create chairs (or tables or doors or mirrors), but built simulations of chairs and tables and doors and mirror with geometric forms covered in Formica, often patterned in fake wood. His sculptures are unusable, even though they appropriate all of the elements of the original, making it impossible to escape consideration of “chair-ness,” “table-ness” or “mirror-ness. ” What makes something a chair? For that matter, what makes something a lawn chair or a dining room chair or a desk chair? Or, in the work of Shao Fan, a Ming chair? So though Shao Fan’s work incapsulates converging values—past and present, East and West, art and design—it is really a well-honed, highly-condensed, parable of the essentials of existence. Like the Buddhist philosophy that originally inspired the creation of the Ming chair, Shao Fan makes us wonder about what is the bare essentials of “chair”, and by doing this, “ourselves.” In a country where the very definition of “being Chinese” is evolving every day, Shao Fan makes us contemplate the essentials of identity and to separate the necessities of life from the superficial consumerism that now defines so much of life. He invites us to sit, or to think about sitting, while all the world expects us to rush forward. By so doing, he grants us a moment of grace, or gracefulness, which was the very purpose of a classic Ming chair ». Shao Fan is an artist who matter-of-factly crosses boundaries that once restricted artists to single areas of expertise and medium. He, like many contemporary artists, ignores categorical imperatives that seem increasingly arbitrary in his constant search for more innovative and expansive means of conceptualization and production. Shao Fan is considered and considers himself a painter, sculptor and designer, a multi-discipline designation that is more the norm than otherwise. Hybridization of mediums and cross-cultural pollination are also commonplace in these days of transnational exhibitions and frequent, far-flung international art fairs, made possible by rapid global transit and instant electronic access. Born in Beijing in 1964, Shao Fan first began using parts of Ming Dynasty chairs, tables and benches in his work in 1995 as the basis for his “non-functional” sculpture, an endeavor that parallels but is separate from his “functional” sculpture: his furniture designs meant for use. Incorporating these distinctive found objects—fragments of the once utilitarian —into the non-utilitarian, Shao Fan deconstructs and re-assembles objects of historic Chinese design, combining them with modern materials such as clear acrylic panels or steel. While deconstruction has become a cliché by now, Shao Fan’s version of it has fresh appeal. Clearly based on his interest in design, Shao Fan’s sculpture is also a continuation of the Chinese tradition—disrupted but not eradicated by recent history—in which the past is both revered and vital, folded into the present as both active presence and validation. It is an attitude that is emblematic of a culture that is not necessarily linear and progressive in a Western, Hegelian sense, although China is now undergoing radical changes once again in a further paradigmatic shift as it transforms itself into a modern state and a major economic and political power. Shao Fan’s sculpture, each consisting of a dialogue between old and new, high and low, eastern and western, art and design, the whole and the partial, the transparent and the enigmatic, is also a critique of attitudes toward the restoration of Chinese antiquities. He wants his viewers to see these fragments as they are, incomplete, in the state in which they were found, as a present reality rather than a distortion or a fiction, their history exposed. Thus, the original form, which is lost, is reconstituted, arranged so that the previous structure is suggested but the work has now been given a new appearance, a different configuration, one that is fastidiously put together. 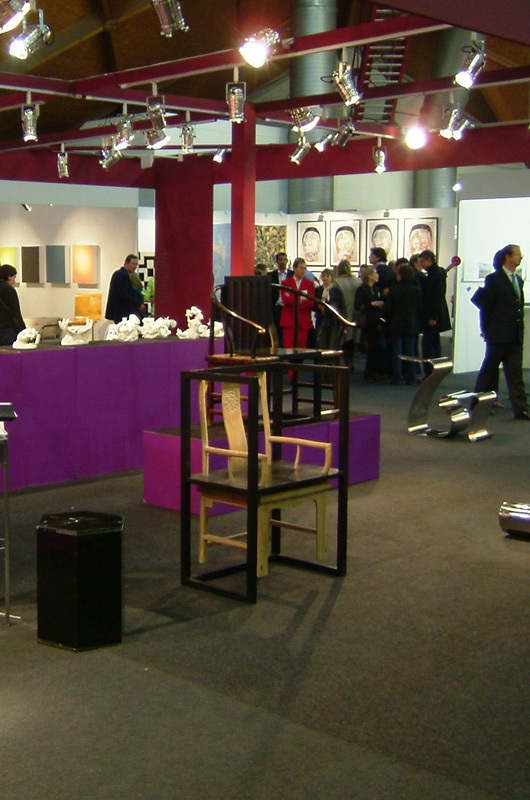 Other artists such as Richard Artschwager, Scott Burton, Jorge Pardo and Shao Fan’s compatriot, Ai Wei Wei – who has also deconstructed and re-interpreted Chinese antiquities influenced, some say, by Shao Fan – share his interest in re-conceptualizing and re-contextualizing design as art and furniture as sculpture. Shao Fan’s sculptures range from the representational and literal to the more abstract, the more formal. 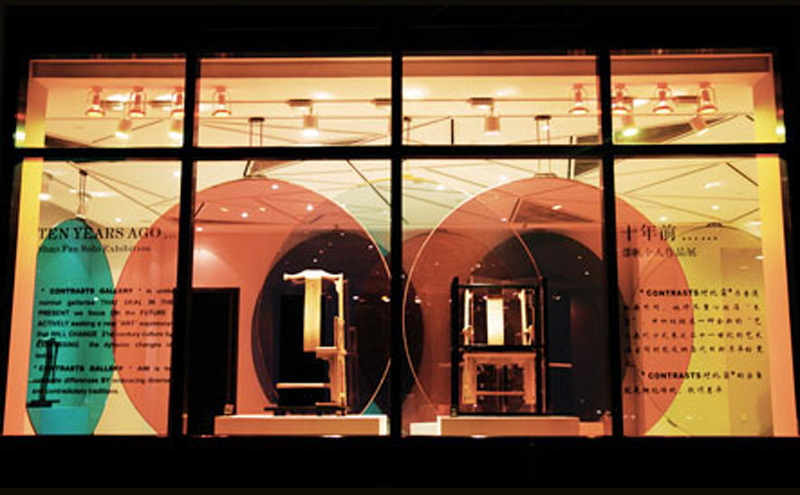 Some look like archeological installations in a museum, which present a semblance of the original form of the object, suspended in or supported by transparent sheets of acrylic. Works such as Guan from 1995, his first series of deconstructed antiquities, are made of catalpa and elm, woods he favor. 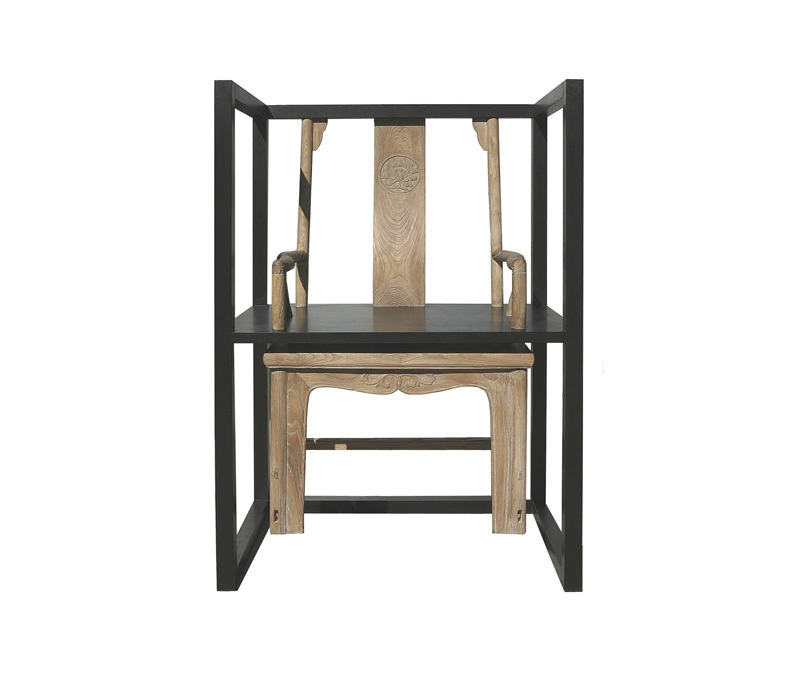 It is essentially an example of a Ming chair in unfinished pale wood and framed by another, minimalist version of a contemporary chair in dark wood, a combination of past and present in which one acts as the doppelgänger of the other. By 2004, Shao Fan has become much freer in his explorations of this strategy, his objects more abstracted, their elements spaced with greater intervals between them, resembling at times a drawing in space, constructed from both wood and acrylic. Suspended by this translucent support, the arms, legs and seat seem to float, hovering on the verge of collapse or reconstitution, an apt metaphor. It questions the nature of the continuity between past and present; it demonstrates that the past provides the material for the present; and furthermore, it shows us that the past is in a constant state of revision as it intersects with the present. Other pieces are non-rectilinear, all of wood, classic furniture types given a twist, such as a striking U-shaped table made in 2005, again of catalpa. It is supported by open, rectangular bases that resemble painting frames, say, the scrolled bracketing reminiscent of architectural details as well as furniture ornamentation. The form is a hybrid of contemporary design and classic Chinese simplicity, the natural colored wood recalling a modernist Scandinavian blondeness. Another light-colored table of catalpa from the same year is O-shaped, the center empty, a zero, perhaps, pitched forward so that the top of the O rests on the floor, its two legs—the same rectangular bases as in the U-shaped table—slanted on a diagonal so that the whole creates an inverted V, or more figuratively, a figure bowing. The last can be read as another version of Shao Fan’s elegant, two-way metaphor: the past bowing to the present, the present paying homage to the past, or both. Another work from 2005 is a narrow rectangular table made with a clear acrylic top and sides, held up by four black inverted supports as legs. It is an intimation of a table, a form that is transparent, imagined, contingent, on the verge of becoming form—or about to dissolve, disappear, collapse. In his recent works, Shao Fan has replaced clear acrylic panels with black ones, so they become more definitive, part of the construction and composition rather than a suspension device, a support system. These more emphatic planes anchor the piece, intersecting to form a chair—a seat with one side set at a right angle—in some ways like the premise of the 1995 sculptures, only more synoptic, if also more complicated. Augmented by components from Ming chairs—delicately curved backs, armrests, legs—that are free-standing, released from their supports, these most recent chairs are even more abstract, more removed from their original functional purpose, approaching pure form. As visual objects, they are an inquiry into the objecthood of a chair, a table, one response to Heidegger’s question: what is a thing? But ultimately, Shao Fan’s sculptures are self-sufficient art works, solid and transparent, palpable and cradled by shadows; memorable instances of contemporary strategies that cross boundaries, cross disciplines.